All guitarists have a vague idea that guitar pickups are the things that generate sound on a guitar. However, for many, understanding stops there. In this expert guide, we’re going to take a look at how they work, all the different types there are plus we’ll look at best guitar pickups for each particular kind of guitar. Pickups are the ‘antennas of a guitar’. Made up of magnets and wire, they sit under the strings in the neck and bridge position, or somewhere between. When the metal strings on your guitar vibrate, the magnets are disturbed, which converts the nearby wire into an electric field or ‘signal’. The same signal then travels out the guitar, via any effects pedals you have, and finishes the journey at the guitar amp. There are broadly two different types: single-coil and humbucker. Single-coil pickups were the first. They work like small antennas, and pick up all of the sounds from your guitar and convert it into an electric sound signal – including, at times, some unwanted hum. It was frustration with this feedback that led to the invention of humbuckers, first seen on guitars in the ’50s. Instead of using just one magnet, humbuckers use two which are wired slightly out of phase with each other. This cancels out the hum and leads to a warmer sound than a single-coil. Although it sounds logical to use a humbucker, many guitarists still prefer the sound of single-coils. They offer a brighter, more ‘twangy’ sound, whereas humbuckers often sound chunky and (too) deep. Most pickups have passive circuitry. This means they use simple transducers which work by many coils of wire wrapping around a magnet. The location of the magnet causes the strings to magnetize, too, so that when they vibrate, an electrical current passes through the metal wire. Passive ones don’t require batteries and are the type you find on Les Pauls (including most Copies), Stratocasters, and Telecasters, among many others. Active pickups on the hand are much less common on electric guitars but have some benefits. They use fewer coils, meaning they’re less susceptible to feedback. They also have a far higher output. This makes them well suited to shred-guitar and heavy genres, especially for articulate phrases that need clarity in their delivery. The drawbacks are they need powering with batteries and have a lack of dynamic range compared to the passive variety. High output pickups are ideal for heavy music, giving you more gain before feeding back; their lack of noisiness brings a clarity that gives your playing a sterilized feel too. Moderate outputs are more dynamically flexible and will be suited to those who like to shift from soft, clean sections to screaming lead parts and also commonly used in classic rock music. 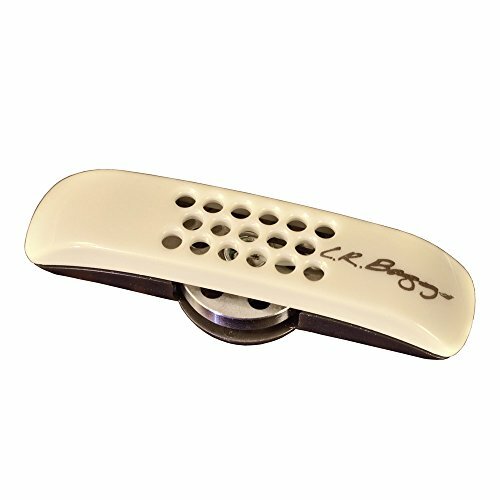 The magnets used in pickups are often ‘alnico’ magnets, meaning they’re made of aluminum, nickel, and cobalt, and were common in the 50s and 60s and offer a classic sound that can be quite soft and warm. 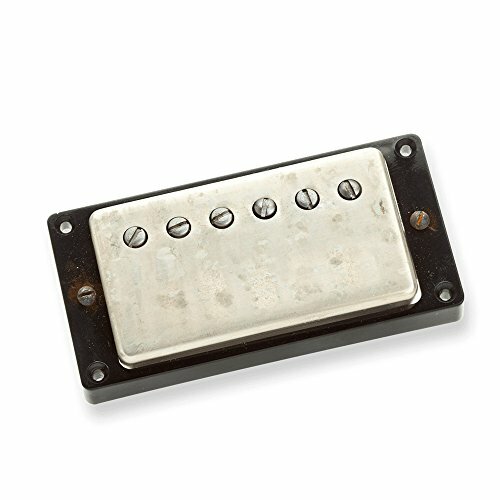 Ceramic pickups gained popularity in the 1970s, and often have a high output. This gives them clarity and produces a stronger sound – they’re cheaper than alnico one and offer a tight, loud growl. Potting is when pickups are sealed in wax to get rid of any air gaps in the coil or on the cover. These air gaps can create microphonic feedback, which presents itself as a loud, screeching sound when you’re playing at high volumes. The wax used is a mixture of beeswax and paraffin, which is heated to a high temperature so that it is runny enough to fill all of the gaps where air might get. If your pickups don’t come readily potted, you can get them done by a professional, or even do them yourself with the right amount of care and guidance. How pickups are wired makes a difference in the quality of your sound. Parallel wiring is when each pickup is wired up to the inputs and outputs together, in parallel. This means the signal reaches the guitar’s output via the fastest route possible, resulting in a clean, twangy and transparent tone. Sometimes, they’re wired in a ‘series.’ This is when they’re connected together, before reaching the output. It produces a very high output, which means that you can let out a much higher signal before running into any feedback problems. The downside to series wiring is that you often lose a lot of the higher end frequencies. Your guitar will have space for either two or three pickups. Each of these has a different purpose, suited to its position. Those close to the bridge will encounter a low amount of string vibration before being activated. This creates a bright sound, which is naturally quite quiet due to its positioning. The pickups designed to be fitted close to the bridge usually have a high output, to make up for the quiet location of the guitar. Pickups designed to go near the neck have a lower output, as the strings vibrate more near the neck, thus giving out a louder natural sound. The tone near the neck will also be deeper (the nearer the bridge of the guitar you go), making it well suited to chunky rhythm playing. Before you dive in and buy a set, consider what sound you’re going for. Do you like heavy, precise guitars with a consistent dynamic, or are you more interested in getting a vintage twang, that you can control the volume of with your picking attack? If your heart’s set on heaviness, a set of active high output ones will do the trick, however, if you’re looking for some responsive ones then old school, passive single-coils are the only way to go. What kind of wood is your guitar made from? Mahogany and rosewood have a dark tone, so finding pickups to complement that will be a priority. Maple, ash, and alder have a brighter sound, so they might be best suited to pickups that hold on to the high-end frequencies. Your volume knob affects your tone, too. 250K pots are warm, whereas 500K pots are bright. Check that it’s physically possible to fit your pickup of choice into your guitar. Many are designed for particular types, such as Strats, Teles or Les Pauls. Others are more versatile, offering compatibility with multiple models. If you have your mind set on fitting some humbuckers into your single-coil guitar but don’t know how you’re going to make it fit, there are now plenty of humbuckers shaped like single-coils to ease your pain. And there are single-coils available shaped like humbuckers. 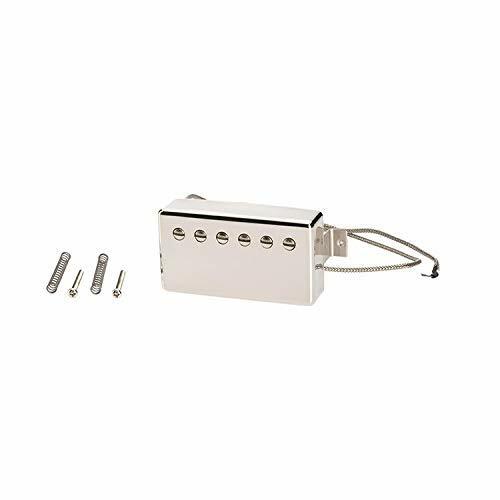 The DiMarzio DP419 is a noiseless single-coil pickup. It has a high output, making it great for heavy players who want a lot of gain, while it’s still passive and allowing for dynamic control at the hands of the player. It also uses alnico magnets to produce a thick tone which is also crisp and bright. It’s designed to fit Stratocasters and in particular the middle and neck positions. It can also work effectively in the bridge position, due to its high output. The hum-canceling qualities of this mean that you have the benefits of humbuckers, with the compatibility and brightness of a single-coil. This is very reasonably priced and comes in black so it will suit many Strat or Strat-style guitars. It will suit Stratocaster players who use their instrument to play a variety of genres and want the single-coil tone with protection from feedback. It will be less suited to guitarists who would like a lower output, for an increased dynamic range. Compatible with all three positions. Designed to fit in the popular Stratocaster. Unsuitable for guitars other than Strats. High output results in a reduced dynamic range. The Gibson ’57 Classic Plus is a passive humbucker pickup that offers vintage tones with a few extra benefits. It has a lot of coils, making it super silent and clear, and there’s also a high output which offers a silky smooth sound and great for precise, chunky lead playing. The high output on the Gibson ’57 Classic Plus means that it deals exceptionally well with overdrive or distortion. It’s also fully wax potted to avoid unwanted microphonic noises. It’s quite expensive, but it can work to make a less expensive guitar sound much better. The Gibson ’57 Classic Plus is suited to a bridge pickup due to its high output and driving, chunky qualities. It will suit a Les Paul player who plays heavy music and requires something that will give their notes clarity and punch. It will be less suited to gentler players, who like to control their dynamics with their picking hand. Thoroughly wax potted to reduce the risk of unwanted feedback. Perfect bridge pickup companion to the Gibson ’57 Classic. High output that is silky smooth. Suitable for the bridge only. Only really fits Gibson guitars. High output might not suit those who want more dynamic range. 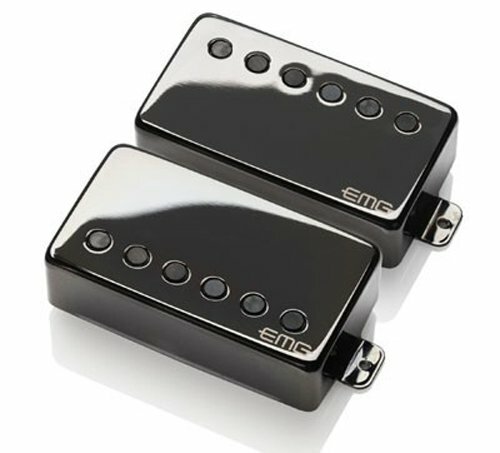 These P90 pickups are passive single coil ones, available in bridge and neck variations. They use two calibrated alnico magnets with a custom coil wind to achieve a warm, vintage sound which is tonally similar to guitars in the 40s and 50s. The Seymour Duncan Antiquity P90s also have a vintage, worn look about them, available in either black or cream. They cost roughly the same as the Gibson ’57 classic ones above, and they’re also well-suited to Gibsons. They’ll suit the guitarist who is looking for vintage tone and requires some control over their dynamics with their picking hand, but less suited to guitars like Strats, which would require some modification before fitting. Uses two alnico magnets to produce a warm but sparkly midrange sound. Replicates the original pickups of the 40s and 50s, giving you a classic tone. If you are looking for the twang of a single-coil, this won’t give you that. Some guitars will need to be modified to fit p90s in. Might be a bit too ‘retro’ looking for some people’s tastes. The Lace Sensor Blue-Silver-Red set are perfect Strat pickups. They’re color-coded red, silver and blue, with the red one being suited to the bridge position, the silver to the middle and the blue to the neck position. The red one has a higher output than the others, giving it a full, powerful sound. The silver one has a pronounced midrange as well as quite a high output, and the blue one has a lower output, giving it a warm tone that’s ideal for the neck position. As they’re passive, you won’t need batteries, and they also use lower energy magnets than you usually find on pickups. This will lead to an increased sustain, so it will be perfect for those who want to emulate Dave Gilmour. This is a reasonably priced set that will be perfect for Stratocaster players who require a variety of different sounds to play a varied selection of genres. It will be less suited to players interested in achieving the heaviest possible sound, and the set will be unsuitable to players on guitars other than Strats. They read a larger proportion of the string than others on this list while picking up less outside noise interference. Lower energy magnets than normal ones, leading to an increase in sustain. Designed to fit a Stratocaster. Inappropriate for guitars that aren’t Strats. The increase in sustain might not suit all genres. 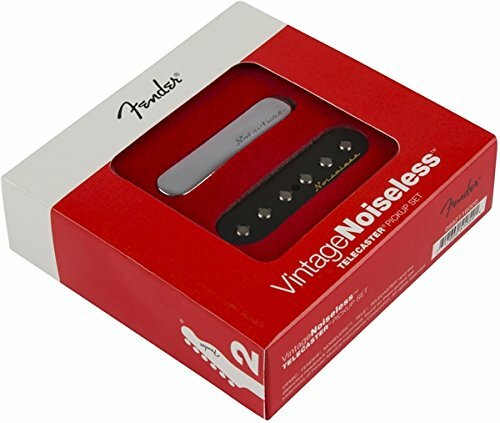 This collection of noiseless single coil passive pickups work great on a Telecaster and use enamel-coated alnico magnets to produce a vintage sound. They combine this with Fender’s ‘Noiseless’ technology to reduce the hum associated with vintage tones. They also include flush-mount pole pieces to ensure an even string response and come with installation hardware to make fitting them as easy as possible. They’re reasonably priced and similar to the blue-silver-red set above and well suited to Telecaster players who love the vintage twang but also want a warm attack, an absence of hum and a non-aggressive midrange. It will be less suited to heavy players looking for something with a high output and beefy tone. Alcino magnets combined with Fender’s ‘Noiseless’ technology produces a vintage tone, without the hum. Enamel-coated magnet encourages a warm, vintage tone. Won’t suit guitars that aren’t Tele’s. You people might prefer less advanced technology if seeking a truly authentic vintage sound. The James Hetfield humbucker set from EMG is made for metal. Reasonably priced in a similar region to the Telecaster and Strat sets mentioned above, these are potted, versatile and easy to install. They can be fitted easily to a guitar that already has humbuckers, without even using a soldering iron. They’re active, giving them a higher output and a heaviness but still have the clarity and punch of passive ones. True to their name, there is no humming feedback present, and they use steel pieces rather than bar magnets, which produces a tight attack and enables a clean low end. The James Hetfield Humbucker set will be perfect for heavy metal guitarists who like to play loud. It will be less suited to guitarists looking for something to be gentle with, or to those who dislike the idea of relying on batteries. Active response gives a higher output than passive, making them perfect for metal. Humbuckers give out no unwanted feedback. There’s a lack of dynamic range compared to single-coils. The L R Baggs Anthem Tru-Mic is designed for use with an acoustic guitar. It blends a piezo with a mini microphone, which lets you fine-tune your EQ as the piezo brings out the higher frequencies and the microphone gives you a bassy warmth. The microphone includes noise-canceling technology, to reduce any unwanted feedback and it can be fitted beneath the soundhole to keep your guitar’s original aesthetic. It doesn’t come cheap but will be perfect for the professional, gigging musician who requires a high-quality amplification of their acoustic instrument. It will be less suited to acoustic guitarists on a budget and might benefit more from buying an electro-acoustic guitar for a similar price. Volume and blend controls, as well as a battery indicator and a phase switch, give you excellent control over your output. Works as a microphone and a piezo in a small plastic house, giving you tonal transparency and the ability to fine-tune your EQ. Uses noise-canceling technology to eliminate feedback. Might prove a bit tricky to install. The bright tone it encourages might not suit all players. If you use a Strat, your main choices are the DiMarzio DP419 and the Lace Sensor Blue-Silver-Red pickup set. The Dimarzio DP419 is a noiseless single-coil pickup, which is well-suited to the bridge, neck or middle position and offers the feedback-reduced benefits of a humbucker with all of the twang and brightness of a single-coil. 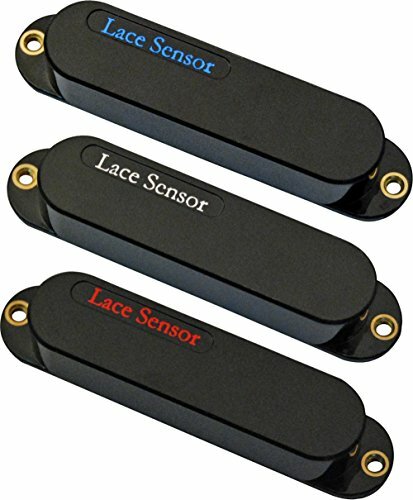 Lace Sensor’s Blue-silver-red set has three different single-coils with slightly different output levels. They use low-energy magnets which lead to an increase in sustain. Both the Dimarzio DP419 and the Lace Sensor Blue-Silver-Red set are passive pickups. If you play a Telecaster, the Fender Vintage Noiseless Tele is similar to the Strat’s DiMarzio DP419s in that it offers no-hum benefits with all of the brightness of a single-coil. This reasonably priced pickup set can turn your Tele from a noisy instrument to a bright, cutting and crisp Tele tone. Gibson players have the choice of the Gibson ’57 Classic Plus or the Seymour Duncan Antiquity P90s. The Gibson ’57 Classic Plus pickups are humbuckers with a high output to offer a silky smooth, clear sound. The Antiquity P90s offer a more vintage tone and look, and have a lower output than the Classic Plus pickups, giving you more control over dynamics. Metal players need look no further than the James Hetfield humbucker set. These pickups are active, so can play loudly and heavily while maintaining quality, and they’re also super-easy to install to metal guitars such as Jackson, Ibanez or Gibson guitars. We only included one acoustic pickup here: the high-quality L R Baggs Anthem Tru-Mic. This combines a piezo pickup with a miniature microphone to achieve a rich, transparent and professional level amplification of an acoustic guitar. Whatever style of music you play and on whichever guitar, we hope that this has helped you to find the right pickups for your genre and your gear.